We were called into remove this Hazardous Tree that was dead for a considerable period of time and neglected on an abandoned property until it went over on the unlucky homeowners house next door! She said she had called into the city on several occasions to report this dangerous issue several times to no avail! Tree limbs can be thrown through windows and crash through roofs, which become a hazard that will do even more property damage. Our specialists are trained to deal with the aftermath of any brutal Nebraska storm. The goal of our specially trained team includes the removal of fallen trees and limbs. We will clear any debris from the site and make the necessary repairs to make things look the way they did before the wind or storm damage occurred. 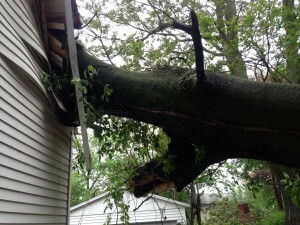 Even the seemingly lightest storm can cause major issues for trees. Allow Torpy Tree Service to help remove this unnecessary stress. Torpy Tree Service is a professional tree and shrub care company serving Omaha, Papillion, Ralston, La Vista, Bellevue, Plattsmouth, Elkhorn, Wahoo, Valley, Gretna, Waverly, Lincoln & Council Bluffs.